We are very happy to announce that two of our terrific sauces have been selected as winners in the 9th Annual Hot Pepper Awards. Our new Salsa Verde picked up two first place wins for BEST MILD and BEST SAVORY and our awesome Chipotle sauce picked up a second place in the Pepper Specific category. To celebrate we are offering FREE SHIPPING on any order over $22.22 when you use code FIESTA at checkout. 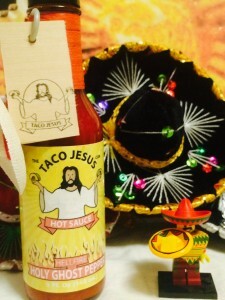 Get on over to the Taco Jesus Hot Sauce Shop and pick up your award winning sauces today. West Coast, East Coast, Gulf Coast? We’ve got you covered. This week we are proud to add three new retail locations to the Taco Jesus family. Out in the west we’ve added Isabella Super Market in Lake Isabella, CA to the family. Isabella Market is out first retail location in California and we look forward to a long and prosperous relationship, so if you find yourself in the Kern River Valley area be sure to stop in and grab some Taco Jesus Hot Sauce to help wash away your sins. On the East Coast we’ve added Some Like It Hot and Spicy to our retailers list. Located on Long Island this give NYC disciples an awesome place to pick up our products and get in on the Taco Gospel. Be sure to say hi to the owner Lonny and tell him Taco Jesus sent you! On the Florida Gulf Coast we’ve added Bauser’s in Dunedin, FL to our locations, so if you live in the Tampa Bay area or find yourself here on vacation be sure to stop in and pick up your sauces from this shop which is just down the road from Taco Jesus World HQ in Largo, FL. Bauser’s also serves up great drinks and offers live music throughout the week.